Frank Soane captained Bath for an unprecedented and unequalled 8 successive seasons, making over 300 appearances and enjoying a 50 year association with Bath Football Club. 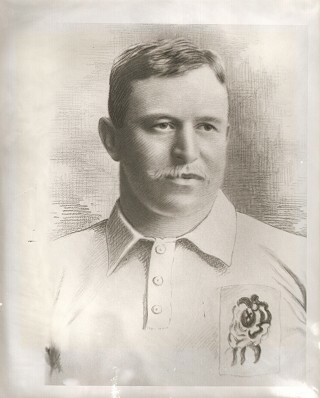 During this time, he also represented Somerset (31 caps) (was Captain from 1896-1899), Western Counties, the South West, the Rest of England and finally was selected by England for whom he won 4 caps, being only the second Bath player to appear for his country. Became President of Somerset RFU after having served as Hon. Secretary from 1896-1899. Although not an especially big man in the physical sense (5ft 9in tall and 13 stones) he was a fearsome forward with a reputation for his fearless tackling and remarkable strength that earned him the nickname “Buster”. He was also a forceful personality, engendering tremendous loyalty and affection amongst his team mates and was a powerful influence both on and off the field. He first played for Oldfield Park R.F.C. in 1880 and joined the Bath Club in the 1881-82 season, making an impromptu debut after going to watch a match at Lambridge where Bath were a man short. Playing in his trousers and shirt, Bath were so impressed with his robust play that they asked him to play again, thus triggering a lifetime of service to the club. In addition to his inspired captaincy over 8 successive years, Frank Soane was an influential driving force in the move of the club to the Recreation Ground. For years, Bath had been nomadic, playing on grounds at Kensington Meadows, Lambridge and Henrietta Park before in 1894 he chaired the negotiations with the Bath and County Recreation Ground Company to move their permanent home to land at Pulteney Meadows, the site of the current “Rec”. His last appearance for Bath came in 1899 against Bristol, although he remained a towering presence off the field until his death at the age of 66 in 1932. This page was added on 31/03/2014.